LEICESTER, England (AP) — Luke Shaw has returned to Manchester United for further assessment after losing consciousness following a bang to his head during England's match against Spain in the UEFA Nations League on Saturday. England coach Gareth Southgate says the defender will follow concussion protocols and be inactive for seven days "but he should be back in the fold as soon as that's done." 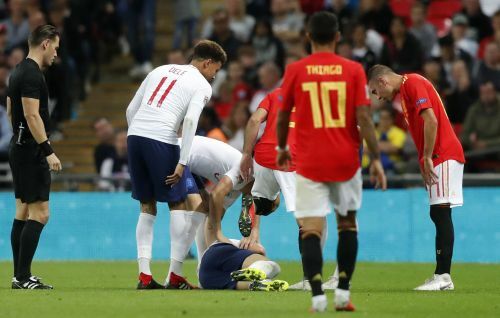 Shaw's head bounced hard on the ground after colliding with Spain defender Dani Carvajal in a second-half incident at Wembley Stadium. He received treatment for several minutes on the field before being taken off wearing an oxygen mask. Southgate says Shaw "was knocked out before he hit the floor." England plays Switzerland in a friendly on Tuesday, looking to end a national record-tying run of three straight losses. 24 Apr NOT AFC 05:30 PM Notts County Res. vs AFC Bournemouth Res.